HOMELife Uncategorized WorkoutsStrength training for women: Why women shouldn’t be afraid of the weight room! Strength training for women: Why women shouldn’t be afraid of the weight room! 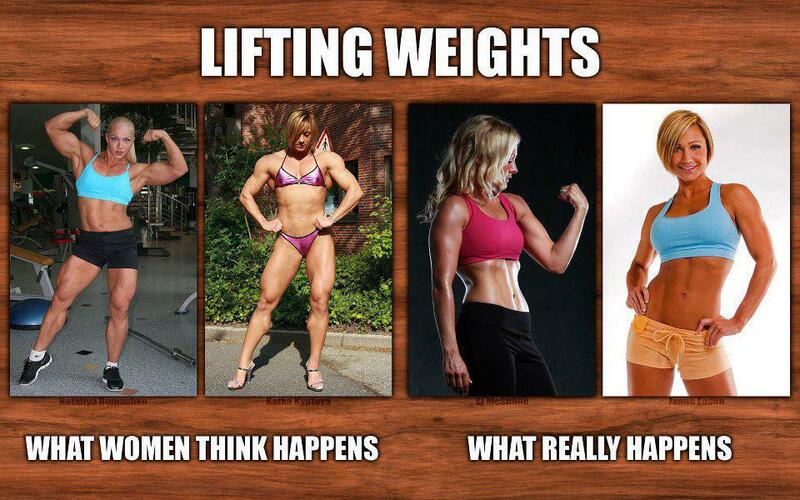 Okay woman to woman, listen up…lifting weights are JUST AS IMPORTANT as cardio, if not MORE! Undoubtedly I hear a lot, “I don’t want to get bulky” or “I don’t want to look like a man.” I am sure you have also heard that lifting is dangerous and bad for your joints. In fact, this is quite the OPPOSITE! Now, it is time to set these myths aside and start lifting some iron! Resistance training comes out on top when your goal is fat loss. WHY!?? Resistance training allows for more calories to be burned during and after your sweat session! Your body hits a state of EPOC ( Excess post-exercise oxygen consumption). When more oxygen is consumed, more calories are burned and your metabolic rate increases. WINNING!! Resistance training = more ENERGY!!! As mentioned before, lifting allows for a higher energy expenditure even hours after training. So instead of that extra cup of coffee, grab a dumbbell!! Resistance training = happy heart!! Lifting that iron can reduce the risk of heart disease and is approved by the American Heart Association as a healthy form of exercise for those at risk!! More muscle means greater calorie expenditure!! The more lean muscle mass you have, the more calories your body is going to burn efficiently …Does this sounds good to you!!!?? OH YEA!! Postmenopausal women are at a higher risk for osteoporosis because the body no longer produces estrogen. Weight training is the perfect way to increase bone mass and decrease risk of osteoporosis! Strength training greatly increases not only your quality of sleep, but also your ability to fall asleep quicker and awaken less often during the night! Go lift to catch some ZZzzZZZ! Stress relief!! Lifting helps to release your happy endorphin’s and keep your anxiety at ease. CONFIDENCE! When you just feel GOOD, you have more confidence! Why in the world would you not want confidence!? Every man and woman deserves to look and feel their best! So, lifting heavy things will not make you look like a man, but it will make you stronger, make you look good, and give you confidence! One Comment to "Strength training for women: Why women shouldn’t be afraid of the weight room!"